Eligible Players: All players with a tracked YPD Account. Participating poker rooms: William Hill, Coral Poker, Party Poker, Bwin Poker, BlackChip Poker, Bet-At-Home Poker, Pokerking, Netbet, BestPoker, Americas Cardroom,Natural8, Titan Poker, Unibet, TitanPoker. Every game type will be calculated for our rake race, e.g. Cash game, Sit&Go tournaments, Heads Up or MTT tournaments. The player with the highest amount of rake/tournament fees will be placed first in the ranking and receives the biggest cash price. All in all 150 players who are generating the most YPD points will obtain a cash price. The poker room will send us an overview with your generated rake/tournament fees which will be integrated in our system. We will update the leaderboard daily. Please be aware that the update process does not carry out in real-time which means that a few points might be missing. If this happens your points have not been included in the data file from the poker room but they will be added to your points balance in the following update. Please note that some poker networks like iPoker, Microgaming or the GG Network, which controls how much rake/fees is counted for each player. Example: You play regularly at Coral Poker on the iPoker Network and you generated 500$ in rake/fees. You had a very good run and made a lot of profit, took the money from the fish and cashed out several times. In this case, the network may only count 70% of your real generated rake, which in this example would be 350$ So the iPoker network is going to count 350$, which will be sent to Coral Poker and as well to us. In this case, you would have collected 350 YPD points. This is just an example, it can be also more or less. How much of your actually generated rake is counted nobody can say, as it depends on many factors. If you would like to get more information for our Main Rake Race please don’t hesitate to contact our customer support in the Live Chat or via e-Mail! All payments will take place in the following month up to the 20th day. Depending on the poker room the payment date may vary, e.g. it could be 2nd or 14th. All bonuses will usually be transferred directly to your players account. In case there are technical difficulties with some poker rooms YourPokerDream reserves one’s right to transfer the amount by Neteller or if the players wish also by bitcoin. 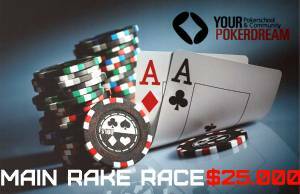 The value of any cash prize cannot be higher than 20% of the generated rake/tournament fees. All information and payout dates you can find HERE.